"In my career, I have used a variety of products, methods and colors to accomplish every one of the characters I have created. What has been clear in every one is that highlight and shadow are the backbone of any character makeup, be it prosthetic or theatrical. As I have evolved as an artist, there have emerged a few "go to" colors that have remained a constant throughout my work. This collection was designed with a selection of colors that I feel are an important part of all of the makeups that I have created, making it easy to accentuate existing sculptural forms and shapes as well as those that need to be created from scratch. Endura has proven to be a valuable asset in my product arsenal. The colors are durable, long lasting and leave the skin with a satin finish that is often softer than the skin prior to application." 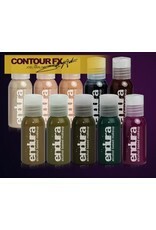 The Endura Contour FX edition consists of alcohol based makeup formulated with the same properties and qualities as EBA’s original Endura brand makeup. 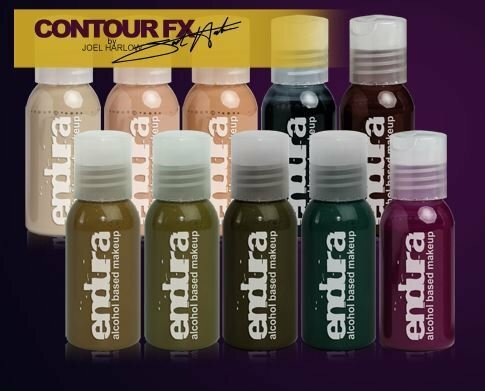 However, Endura Contour FX liquids come with higher level of pigmentation resulting in an increased coverage and more versatile application including airbrush, brush and sponge. Additionally, Endura Contour FX carries lower viscosity enabling artists to work with reduced airbrush psi settings inside enclosed makeup trailers or small rooms (without the “makeup cloud effect”). The Endura makeup provides exceptional wear ability and water resistance when used on human skin and it also holds extremely well when used on foam, latex, rubber or encapsulated silicone prosthetics. All ingredients are of a cosmetic grade and all pigments are approved by the FDA. For more realistic and translucent effects the Endura colors can be cut down with the TRANSLUZ thinner without sacrificing the quality and consistency of the paint. Endura makeup can be easily removed with EBA’s alcohol based VAPORE or with the alcohol free UNVEIL makeup moisturizing remover.